Will forms are legal forms or documents used for distributing the assets which include personal properties, intangible properties, real properties, and so on to the named or stated beneficiaries. This process will require an executor who will maintain all the properties. 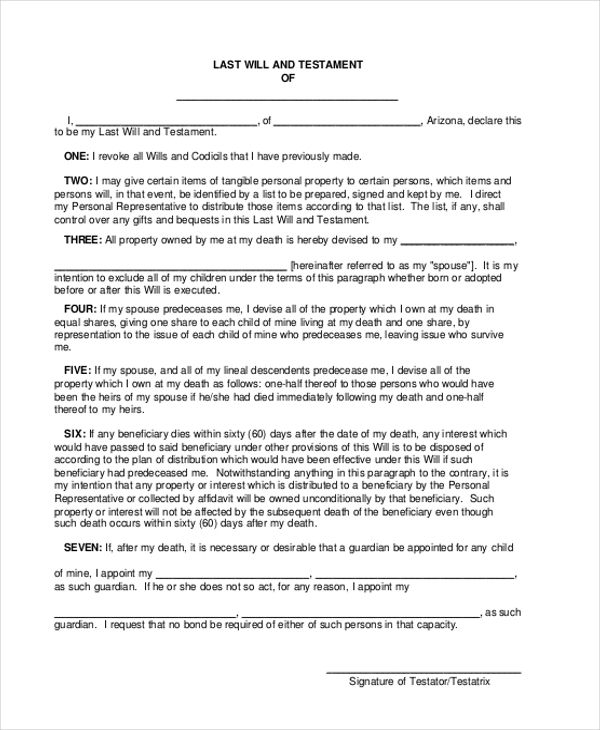 The executor can be chosen by an individual who is writing the will. The executor will carry out all the legal procedures required in fulfilling the last wishes of the individual. Wills will try to avoid estate administration process from forcing the sale of these properties and items. 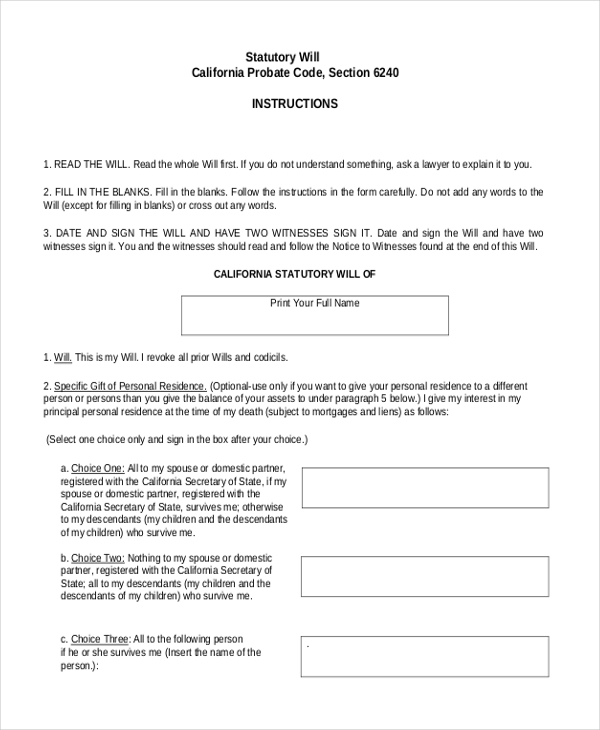 There are different types of Will and Trust Forms which are stated below. A living will is applicable only when a person is suffering from terminal health conditions. 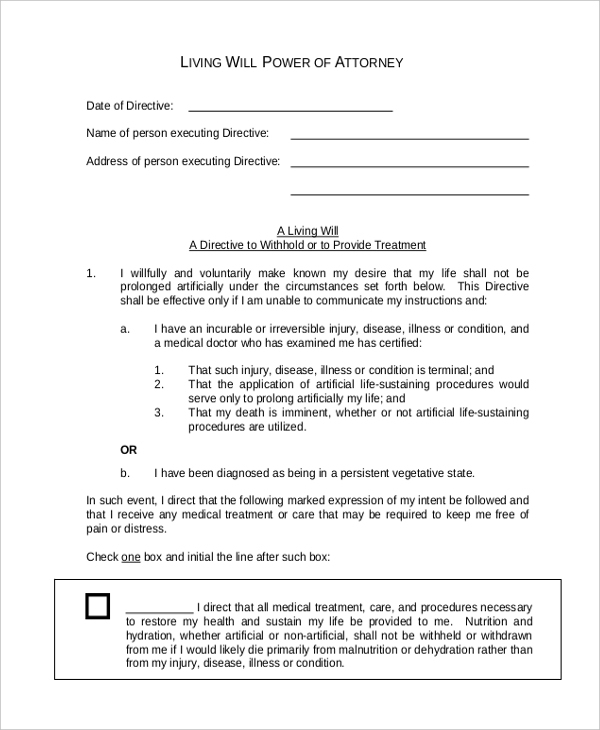 The living will inform the person’s health care professional whether he is willing to die by delaying the procedures used if he is unable to state his wishes due to the terminal health issue. 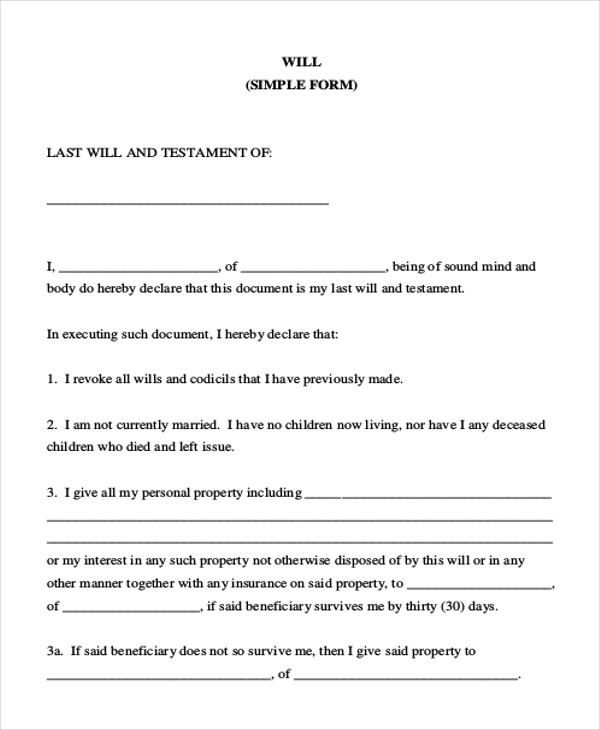 Last will and testament forms are filled to create a will with the intention of reducing legal disputes and extra costs for the people surviving after your death. This form will make sure that the last wishes of yours will be carried out. 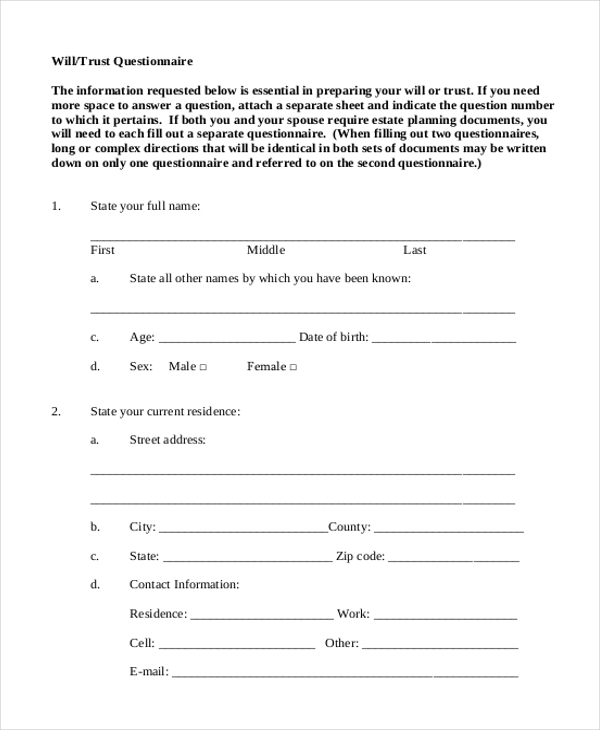 Blank will forms are the forms that should be filled by an individual in order to create a will. The form expects an individual to fill his personal details of the properties and state the name and address of the persons (guardians) to whom he is willing to transfer the assets after his death and the provisions related to it. The individual also has to fill the details of his executor. 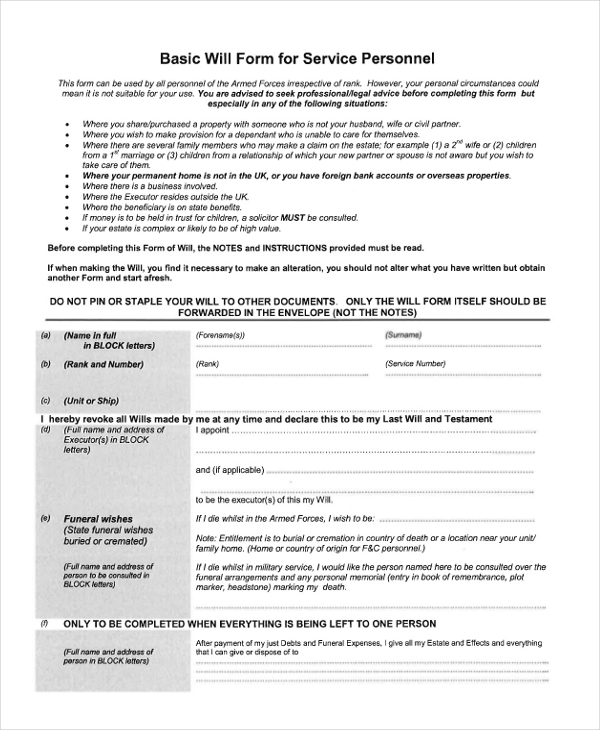 You may also see Medical Power of Attorney Forms. The standard will form is required to fill in the details related to a gift of money, a gift of a part or share of your estate, codicil, and information related to two witnesses. 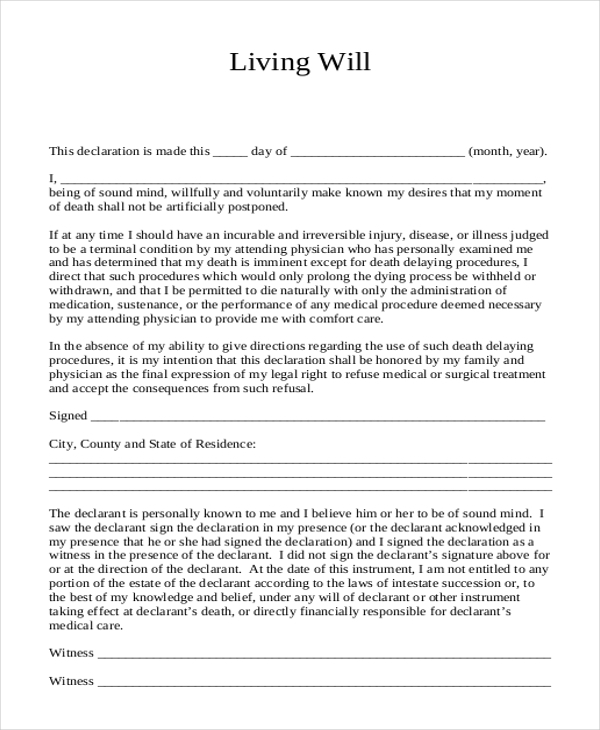 A living will power of attorney form is filled by an individual suffering from any health issues where he gives details about his health conditions, how his assets need to be distributed or utilized in regards to his medical treatment and expenses. You may also see Warranty Deed Forms. Basic will form for personnel service is created for the distribution of the personal assets like money, automobiles, houses, specific gifts, etc among the spouse, children or any other person who the individual considers to be close and shares a special relationship. Statutory will form shows the detailed procedure of filing the will form. The form will provide space for filling in the personal details, various wishes like funeral wishes and others, the details of the persons who you want to nominate, and guidelines to carry out the process. You can also see Health Screening Forms. As the name suggests, will and trust questionnaire form is a set of questions provided for an individual who wants to create a will. These questions include the individual, his spouse, children, properties and estates and the way it should be distributed. If the space provided is not sufficient then the individual has to attach a separate sheet and provide details so that it is easier to create a will or a trust. Will deposit form is filled in order to keep the will safe in a Public Trustee’s Will Bank. Along with the original will, a will deposit form and two forms of current identification are required to keep the will safe in the bank. 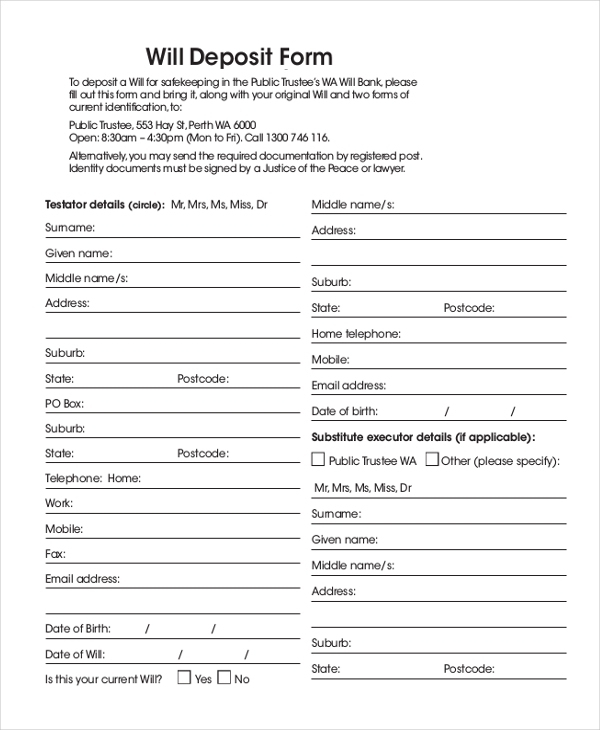 The form required to be filled for creating a will is known as will preparation form. The details to be disclosed include personal information, selection of executor, information about children, details about leaving behind fixed amount of money, information on specific items and sharing of what is left. Also, the form expects an individual to fill his last wishes related to funeral arrangements or any other special arrangements. The will is targeted to those people who are interested to know how an individual’s properties and estates are divided and who will get what amount of share in his or her assets. Also, the will is addressed to people who share special bond and relationship with the individual and are concerned with his or her last wishes and how those wishes need to be fulfilled. Apart from these people, the state authorities, banks, and tax departments are also interested to know about the will to deal with legal proceedings. They also form the target audience. Therefore, the target audience includes family, dear ones, government and banks. 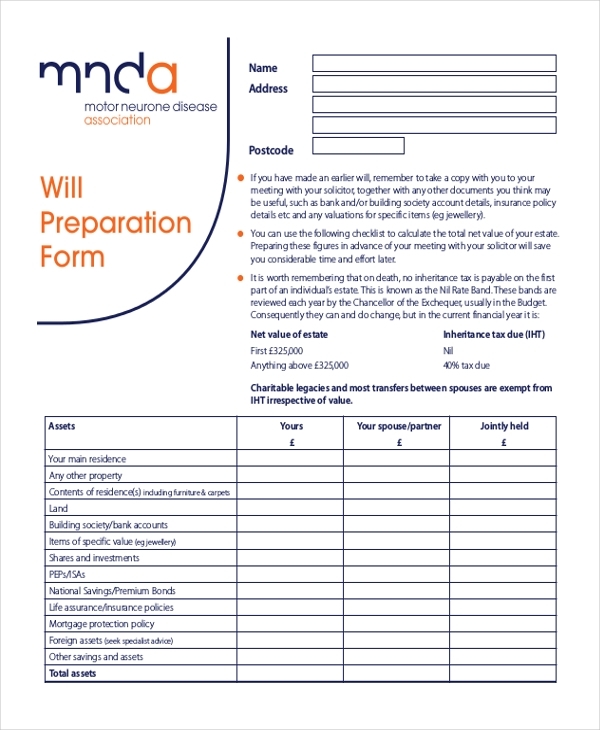 What are The Benefits of Will Forms? There are many benefits of writing a will. Will forms will allow you to choose a trustworthy person who can look after your properties and estates in the way you wish in your last days. They act as personal representatives. Will forms can help you create guardians for your dependants. These forms will legally give the rights for your dependants to enjoy the provisions. You can also see Free Will Forms. The guardians have to take care of the dependants if it is stated in the will. The will also give you the right to state the process of burial you wish for and other funeral wishes. A properly drafted will can avoid or reduce the estate taxes that were on due. Moreover, it will give you self-satisfaction for resting your properties and estates in the right hands. If a person fails to create a will then, the deceased person’s properties and estates will be distributed under the provisions created by the state intestacy law. It may also be forfeited to the state. 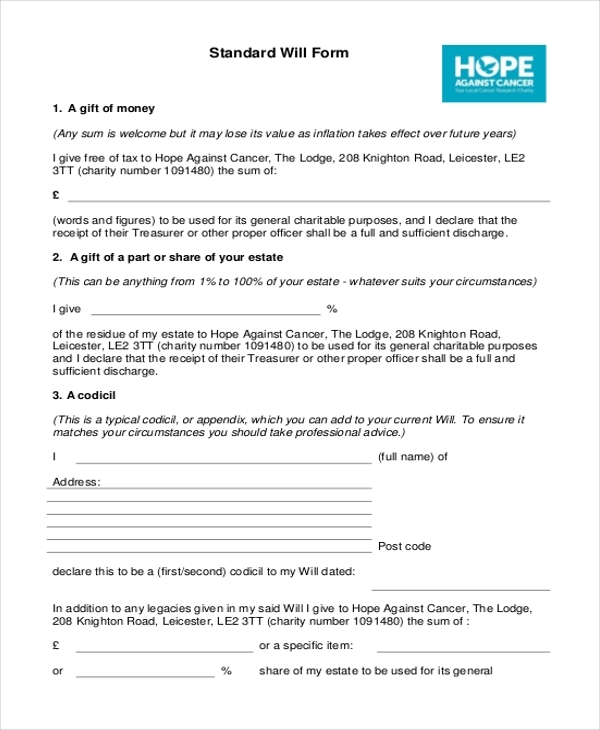 Therefore, it is suggested to write a will and rest your hard works in the hands of those who you think will protect and use it for a good cause.